Rosie threw up yesterday. 3 times. And in true child fashion didn't make it to the bathroom in time. A well meaning person mistakenly gave her egg matzoh and a Passover cookie containing eggs. I wasn't with her at the time, and the individual had been instructed on her allergies. Mistakes happen. It's frustrating when our children experience pain as a result though. The same day Lillie came home and told me she had been given matzoh for a model seder at school. Her teacher immediately realized the mistake and removed it from her plate. I asked if she got a new plate? Cross contamination anyone? She did. I think no matter how much we express to others the dangers of allergic/intolerant foods for our children, unless they see a reaction, they don't get it. They aren't washing a half a dozen vomit soaked towels, or rocking a celiac child at 3 am who woke up with a crushing stomach ache. I realized there is just so much we can do. I am frustrated, but no one is going to watch out for your child like you will. It's a parental instinct. That being said, we cannot give up on educating and setting clear guidelines for our children's food needs when they are in the care of others. The night before I had been so proud of myself for whipping up (literally) a decadent gluten-free chocolate mousse without any dairy products or eggs. Those pesky eggs. So prevalent in Passover cooking. Yet last night I I of course was excited to have a dessert both Lillie and Rosie could both eat without worry. The fact that I had a couple of servings before sticking it in the freezer didn't hurt either! It is a tricky time of year with every store bought Passover cake containing eggs and every recipe for fluffy potato starch sponge cakes requiring at least a half dozen eggs. I hope the recipe below will help someone who is in the same predicament as I. So lick your spoon and sit back contentedly with the knowledge that you are keeping your food allergic/intolerant children safe...at home at least. In a medium sized microwave safe bowl, place 1 container whipped topping, chocolate chips and coffee granules. Microwave on high for 2 minutes*. Stir until smooth and well combined. Allow to cool for 20 minutes. In a large bowl with an electric mixer on high, whip remaining container of whipped topping and vanilla extra until stiff peaks form. Fold in half of cooled chocolate mixture until well incorporated. Fold in remaining chocolate mixture. Pour into a plastic container with a tight fitting lid. Refrigerate or freeze until ready to serve. *Note: You may do this in a double-boiler on the stove over low heat. Stir chocolate mixture occasionally until melted and smooth. Serving Tips: This versatile mousse can be garnished with berries, whipped topping, chocolate curls or crumbled macaroons. You may use the mousse as a filling for a frozen pie. 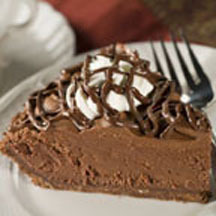 Fill prepared "cookie crumb style*" pie crust with mousse. Cover tightly with plastic wrap and freeze until firm. Decorate with whipped topping and chocolate syrup if desired. For Cookie crumb pie crust: Mix together 1 1/4 cup finely ground gluten free cookie crumbs and 1/4 cup melted margarine or butter to form a crumbly mixture. Firmly press into bottom and up sides of pie plate. wow! i'm totaly gonna try this. not only does it sound great but also easy for cooking impaired moms like me. my son's eyes get so big and beautiful with excitement when i tell him i made it special for him without any eggs. passover is always more than a challenge for me (him!) and this might make it a little easier. thanx!